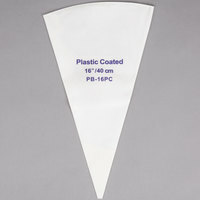 This 16" pastry bag is an excellent choice for decorating pastries, cakes, cupcakes, and other confectionery delights! Whether you're decorating at a commercial bakery or a casual home bakery, this pastry bag is a reusable option to help you lessen your environmental impact. Because of its plastic lining, this bag is ideal for piping fatty or oily products but is also great for piping regular icing. Made of cotton cloth with a plastic-coated interior, this pastry bag is simple to clean and offers a surface that is easy to grip even when your hands are slippery. Easier to remove colored frosting when washing, big to fit enough so you don’t need to be filling it up so many times, flat for easy storage. I already own this bag in a larger size, but I wanted a smaller one for a home projects. The quality is fantastic. The canvas makes it easy to work with and the plastic coating makes it a breeze to clean. These pastry bags are nice and high quality, comparable to name brand ones. The 16" is a good size for larger tips for icing cupcakes. This 16 inch bag is well constructed and a better alternative to a disposable piping bag. A 16 inch bag is big enough to frost some decorations on a cake without having to refill very often. Good bag for the money. Saved lots compared to bags I have bought from restaurant supply companies in the past. Will buy more in the future. In order to make fancy looking desserts it is necessary to have a good quality pastry bag. These bags are a great value and are about half the price of the pastry bags at our local restaurant supply store. We would much rather get the bags shipped to our door instead of paying more and having to drive and get them. Nice and large pastry bag for great price! Easy to use and it is reusable! I like to use this one for large amount of frosting but you can use it for anything! Solid bag at a great price. I find that it wasn't always easy to get the separate tips to work but you can certainly manage by simply cutting the bag. These work just as well as others and I will buy again! 16" large capacity plastic coated pastry bag. This is surly the way to get larger quantities of cupcakes and other baking items dressed and designed quickly. Not to mention more efficiently. This 16" pastry bag is nice when doing larger dishes. We use this one for piping our deviled eggs. Any tip will fit since you cut the opening to match the tip. Easy clean-up and it doesn't seem to discolor like some bags since it is plastic coated. These bags are easy to use, easy to clean, and easy on the pocketbook !! You can buy these in bulk and it makes decorating with lots of colors a breeze ! The bag holds up well to stiffer frosting/icing which the disposable bags do not. The quality of the bag for this price-point is terrific ! I love the plastic coated pastry bags. As a food lover, I have used this bag for devil egg mix, cupcakes, cakes and more. I recommend using the 16 plastic coated pastry bags for any catering or cooking event. These are a must for any high volume need. Very strong and durable! Washes up very quickly too (unlike plastic ones). They can hold heavy - duty product as well as light (think mashed potatoes vs whipped butter/frosting). I absolutely love this product! This 16" plastic coated pastry bag works great! The inside is plastic which makes it easier for the filling to slide through. Great quality! I love the plastic coating on these bags, it makes cleanup very easy. The only thing you can not use the plastic coated bags for is piping hot things that may melt the plastic. The 16" bag is a great size, large enough to hold alot of whatever you are piping but not so big it is unwieldy. You can't have enough of these plastic coated pastry bags in your kitchen...I love them. They are durable and strong and it's coated making cleaning a breeze. I highly recommend. These piping bags are "ok"... not as high of a quality as a Ateco- flex. They started to get a pilly feeling on the outside and eventually started to bleed the icing out, resulting in a slippery bag. Much cheaper than the store and less wasteful than plastic as well. This is a strong pastry bag for an excellent price. This 16 inch bag comes in handy. This is a great bag, it is great for making deviled eggs. We like that we can fill the eggs with the filling and make them look really nice without the mess. I AM REALLY LOVING ALL OF THESE PLASTIC COATED PASTRY BAGS THEY ARE FANTASTIC..VERY DURABLE AND HAVE A FABULOUS PRICE COMPARED TO NAME BRAND ONES...THEY WORK GREAT AND GET THE JOB DONE..I WILL CONTINUE TO BUY THIS BRAND CAUSE THEY ARE WELL MADE, FLEXIBLE AND CLEAN UP IS A BREEZE....QUALITY PRODUCT..RECOMMEND HIGHLY...I PURCHASED ALL SIZES AND AM VERY HAPPY I DID...WOW THE 24" ONE IS BIG..LOVE IT..WON'T NEED TO REFILL TOO MUCH EVEN ON A BIG CAKE. Great pastry bag. They are a bit stiff at first- which can make it difficult it use things like whipped cream, but they loosen up with time. 16" Plastic Coated Pastry Bags are a decent product for the price. They hold up ok. They are a little on the thick side. When using icing in them you must remove the icing and wash and hang the bag to dry. If icing is left in the bag overnight the bag becomes grease soaked. 16" bag is very generously sized and makes large production a breeze. Good quality construction, will buy more as needed. I can only recommend it. Very nice substantial pastry bag. Easy on the hands and is large enough you don't have to stop and refill terribly often. Great product for the money. This bag is great for piping pastries and cookies. Works with a coupler or just a tip inserted into the end. Large size lets you pipe out a lot very quickly. Flexible and cleanup is good. This a good decorating bag. The plastic coating makes for easy and sanitary cleanup. I really like using these because they feel in the hand is nice and it seems like the icing comes out better with the plastic coating. This is just the right size for what I needed. We make spinach manicotti and trying to fill it with a spoon has always been difficult. This piping bag make things so much easier. I just use the Ateco 809 11/16" Plain #9 Pastry Tube with it and making manicotti has never been so quick. The bag is also coated so it cleans easily for the next use. Good quality piping bag. The little hook at the end to hang it while dryer is a nice touch that not all other brands have. This larger pastry bag is a good size for piping large amounts of frosting. The plastic coating still gives a good grip while making it easy to rinse out. Very nice, high quality piping bags. Clean up well and do not have a slick feeling on the outer side like some other bags do. Good quality bag and the size is right. My only complaint is the thicker material near the tip makes it difficult to screw your tip on and lock in place. Can be done, but is just a little harder to get to screw on. This item needs to be pulled out of the bag as soon as possible - washed and air dried. The smell is very offsetting for icing - needs about a week to air out. These icing bags are wonderful to work with, it holds the material well, with whatever you are working with, the material is durable, easy to clean and feels good when piping. I needed more pastry bags and these were prefect. You can cut the tip to the size of your liking. These fit a good amount of frosting and work really well with piping french macarons. The 16" plastic coated decorating bag is very good quality! The outside is a cloth material and the inside is plastic with a firmer plastic at the tip. I recommend this bag! Decorating bags are a must for any avid cupcake maker. I love the coating and large size of these bags. I've bought non-coated bags prior to this, and they become dirty and developed an off smell over time. These bags completely avoid that issue, fortunately. This pastry bag is large enough to pipe the iding on a whole cake. It is strong enough to even pipe whipped butter into portion cups. Very durable and simple to clean. I've had these since last year and still using it. Definitely an item worth recommending! Will purchase again soon! I *love* this bag! The size is fantastic - large but not at all unwieldy. The material is sturdy and easy to clean. I'll be buying more! This is a fine quality bag, large enough for piping, say, mashed potatoes onto a shepherd's pie without squeezing the contents out from the open end. The Pastry Bag 16" Plastic Coated Decorating Bag .Is great you need one for every basic color to add the finishing touch to all those pastry's. They are easy to clean with soap and water. Great price. Great icing bag! it was a bit "crisp" to start with..but the quality is really nice. I haven't used it with a bright color yet, so I'm not sure if the cloth will absorb the coloring & turn pink. the tip end is re-enforced for strength. I'll be ordering more at this price (even including shipping!) its a deal! This a nice pastry bag. I ordered 2 of these and they are just the right size for icing cupcakes. They don't get sticky like other bags. This bag has held up well. It is easy to trim and easily cleaned when turned inside out. Will order a 14" next time around.